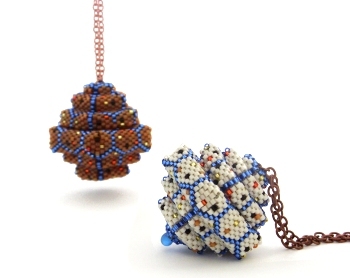 These "pendant with a secret" pieces developed from my Geometric Series of beadwork. Based on the pentagon shapes I have explored in previous pieces, these take the idea a step further with the creation of a pendant where the lid and chain form an integral part of the piece. The colours and design of these pieces were inspired by Gaudi. You can see the original pendants here and a variation of them here. The instructions for this project are now available to purchase.